Located in the Kul Tiras subcontinent and nestled between the sea and great mountain ranges to the north and south, the ancestral home of the Proudmoores is a bustling land of opportunity—if you know where to look. Join us as we take you on a brief tour of Tiragarde Sound and the capital city of Boralus. 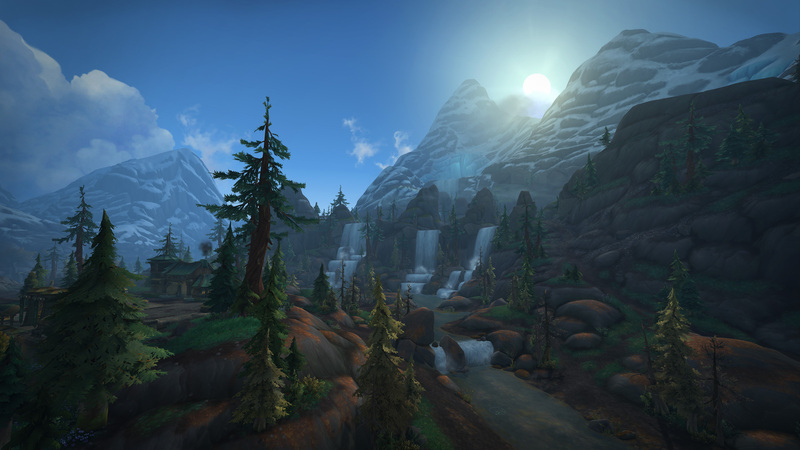 The region of Tiragarde Sound serves as the heart of Kul Tiras. 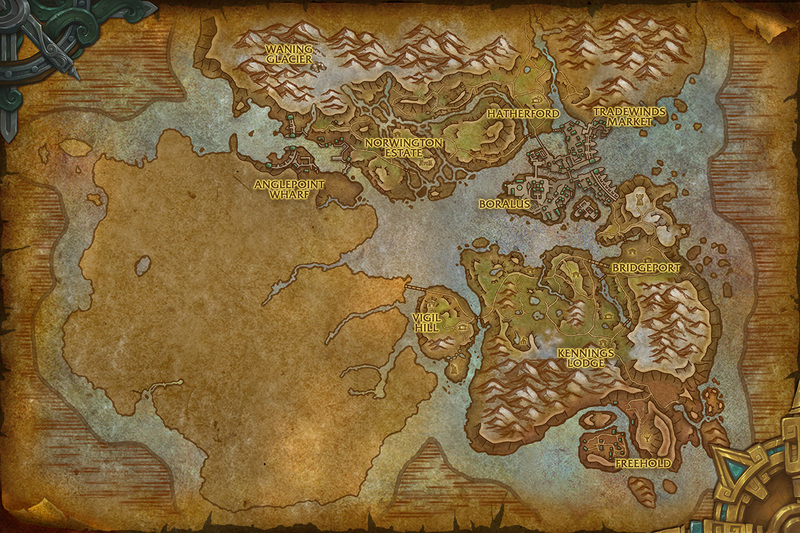 Nearly bisected by the capital city of Boralus, the land is rich with wildlife in the hills and mountains to the north and south, and its people enjoy the bounty of the oceans to the south, east, and west. It is a realm of people in touch with both the land and the sea. Any hopes for a warm reception in Tiragarde Sound will be quickly dashed upon your arrival. Wounds run deep between the Alliance and the Kul Tirans, inflicted by the tragic events that led to the death of Daelin Proudmoore. Your mission of diplomacy will begin on rough political seas, and the journey to redemption will be a long one. The heart of Kul Tiras is sick with infighting and corruption. Gangs run rampant, while the region’s noble leaders squabble for power and influence. It will take determination to get to the root of all that is transpiring here and restore the glorious legacy of the Proudmoores—the future of the Alliance depends on it. Boralus is a city beholden to the sea. Roughhewn wooden planks line intertwining walkways, terraces, and stairs. Sea-weathered rooftops and awnings adorn the buildings, while amber-lit windows and walkway lanterns lend honeyed tones to the atmosphere. Stone thoroughfares and hanging colorful nautical flags strike a contrast to the sea-worn brick-and-wood construction, creating a sense of warmth despite the chill of the surrounding sea. The sounds of Tiragarde gulls can be heard crying overhead as you explore your new home away from home. Iron-reinforced locks in the center of Boralus Harbor bar the way from the sea into the inner channels at the heart of the city, while cannons on either side serve as an additional deterrent to vessels approaching with ill intent. Great galleons make their berth in the harbor, but at first blush, these ships don’t appear to be quite the naval force the Alliance was expecting to find in Kul Tiras. Things to Try: Feeling a bit overwhelmed by your responsibilities to the Alliance? Take a moment to pet one of the wandering dogs or cats and your stress will slide away. If that doesn’t work, head to Hook Point to watch the fishmongers toss a few fish. Within the harbor’s Tradewinds Market, visitors will find everything they need for an extended stay in Boralus. Merchants from all over Azeroth are drawn here to hawk their wares, traveling well-establishing trade routes between here, the town of Hatherford, and the fertile lands of Stormsong Valley. Facilities include an inn; three portals to Stormwind, Ironforge, and Exodar; a ship to Stormwind; Profession trainers; a bank; vendors; an Expedition Map; and more. Don’t forget to pick up your ferry pass so you can travel by sea as well. Mind where you wander in this expansive city, and take care where you wind up. Not everyone in the city is a fine, upstanding citizen, and it’s dangerous to find yourself on the wrong side of town. You’ll find many more estates and ports to explore throughout Tiragarde Sound. You’ll soon discover the situation among the nobility is becoming explosive, and you’ll need to seek out the source of it all. Did You Know? The term “gunnel” (also known as the “gunwale”) refers to the upper edge of the side of a boat or ship. To the northwest of Boralus lie the green rolling hills of Norwington Estate, where you’ll be able to delve into Kul Tiran culture, take part in their festival, and embark on a tour. Animal husbandry and horsemanship are important disciplines to the Kul Tirans, many of whom are skilled riders and falconers. Further north you’ll encounter the Roughnecks, who are responsible for training the gryphons used by the Kul Tirans. You’ll need your cold-weather gear if you plan to trudge into the Waning Glacier and brave the bitter cold winds that blow through its crenellated passages. While they’re renowned for their naval prowess, the people of Tiragarde Sound are accomplished hunters as well, even going so far as to seek out the terrifying monsters that lurk in the depths of the Great Sea. Those who enjoy a little hunting and fishing will want to visit Kennings Lodge south of Boralus, and there’s plenty of opportunity to seek out game in a land where wild Fjord Mustangs run free—there’s something for everyone here. Further south, you won’t find a bigger hive of scum and villainy than Freehold. It’s populated by pirates, scoundrels, and those who claim to seek to live free of Kul Tiran control. These scoundrels pose a growing threat to the ruling families of Kul Tiras and are due to be reined in before it’s too late. *There are three new dungeons in Kul Tiras: Freehold, Tol Dagor, and the Siege of Boralus. Freehold, Tol Dagor. and Siege of Boralus Dungeon Spoilers Inside! 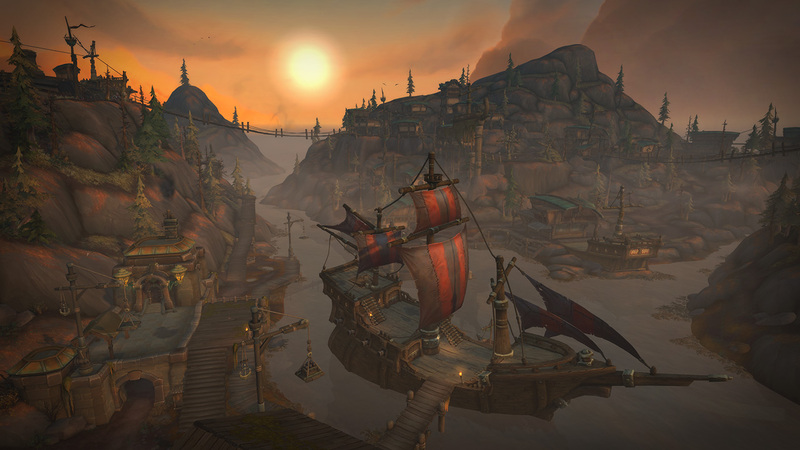 Freehold has traditionally served as a haven for pirates, scoundrels and those who wish to live free of Kul Tiran control. Now, the Irontide Raiders have brought the city under their harsh rule and are coercing the various pirate crews under their banner. While the pirates gather, a small group of heroes must infiltrate the town and eliminate their leadership to dissolve this growing alliance of cutthroats. Skycap’n Kragg: Skycap’n Kragg and his faithful mount Sharkbait are the guardians of Freehold, continuously patrolling the sky on the lookout for intruders. At least, that is what they’re supposed to be doing. Instead these two are often found snoozing in their crow’s nest or dropping guano on unsuspecting victims from above. Council o’Captains: Captains Raoul, Eudora, and Jolly meet within freehold to drink and confer. They lead the Blacktooth Brawlers, Bilge Rats, and Cutwater Corsairs crews, currently gathered under the banner of the Irontide by Harlan Sweete. Ring of Booty: Within Freehold, there is a fighting tournament where the fiercest brigands from around the seas test their might. This rogue’s gallery consists of a strange assortment of contenders, but none so fearsome as the current champion, Shark Puncher. Countless challengers have sought to topple the powerful pugilist, but all of them have end up as chum. Harlan Sweete: Harlan Sweete is the leader of the Irontide Raiders, and his vast wealth is only exceeded by his foulness. Currently bankrolled by Lady Ashvane, Sweete has been tasked with uniting the various pirate crews by any means necessary. The Sand Queen: Little is known about the monstrosity that lives in the sands surrounding the prison. No prisoners have ever survived an escape attempt—guards only finding discarded clothing and bones. Jes Howlis: A vicious pirate of dubious loyalty, Jes Howlis was captured alongside his brother and locked away. After being released in a prison riot, Jes has since taken over as the de facto leader of the gang that controls the prinson's lower levels. Knight Captain Valyri: Knight Captain Valyri oversees the explosive munitions within Ashvane's armory. Unfortunately for her subordinates, her obsession with fire often creates hazardous working conditions. Overseer Korgus: Warden to Tol Dagor, Overseer Korgus maintains the mighty island prison. His love of Azerite is widely known, even going so far as to infuse it into his bullets and test the results on his prisoners. Lady Ashvane has unleashed her fury against the capital citiy’s waning defenses. As Boralus burns, a small group of heroes must quell the rising chaos and put an end to Ashvane’s plan to dominiate the region. Chopper Redhook: Chopper Redhook’s brutality is feared throughout Kul Tiras. Supported by Irontide forces, Chopper is free to rampage through Boralus relishing the chaos rampant in the streets. Dread Captain Lockwood: Dread Captain Lockwood commands a host of Azerite artillery. Currently her cannons are trained on the palace, threateneing to reduce the seat of the Proudmoore’s power to rubble unless they surrender. Hadal Darkfathom: Hadal Darkfathom is an ancient sea giant called form the depths to unleash his fury on Boralus. Using his powerful strength, he crushes buildings, statues, and civilians alike. Viq’Goth: Summoned from the depths by Lady Ashvane, Viq’Goth has devastated the harbor. Capable of pulling entire galleons to the crushing depths, this leviathan must be defeated before the Kul Tiran fleet is destroyed. There is much to experience in Tiragarde Sound, and untold dangers await throughout its hills and valleys. Inland, the mountains and forests provide prime hunting grounds. A vast coastline borders Tiragarde Sound to the south, west, and east, where those brave enough can fish, boat, swim, and hunt for treasure—just be sure to bring some earplugs for the sirens on the southern coast. When you’re ready to venture outside of Tiragarde Sound, the rolling hills and mountains of Stormsong Valley lie to the north, while westward you’ll find the stygian hills and mountains of Drustvar. Your opportunity to earn your way into the good graces of the Kul Tirans awaits.